Christie Pfoertner and Sherryll Jones at Saturday’s water quality monitoring training. The watershed of the Peconic Estuary is 247 square miles. It’s 46 miles long and 18 miles wide and contains 453 miles of shoreline and 140 globally and locally rare species. Between 100,000 and 280,000 people live here, depending on the season, but few of those people are scientists who can quantify the water quality in every corner of the estuary. That is, few of them are yet such scientists. That’s where the Peconic Estuary Program is hoping to make some inroads this year, by training East Enders to take water samples of the bay and test them for a range of factors, from acidity to salinity to nitrate levels, bacteria, dissolved oxygen and water temperature. 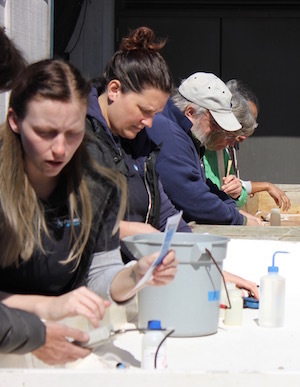 Eight brave souls participated in PEP’s first water quality monitor training session, held at the Suffolk County Marine Education and Learning Center at Cedar Beach in Southold on the morning of Saturday, March 12. Volunteers worked Saturday to measure the water quality parameters in Cedar Beach Creek. PEP Education and Outreach Coordinator Sherryll Jones and Education and Outreach Assistant Christie Pfoertner spent the beautiful early spring morning teaching the trainees about the scientific methodology that is crucial to accurate testing. 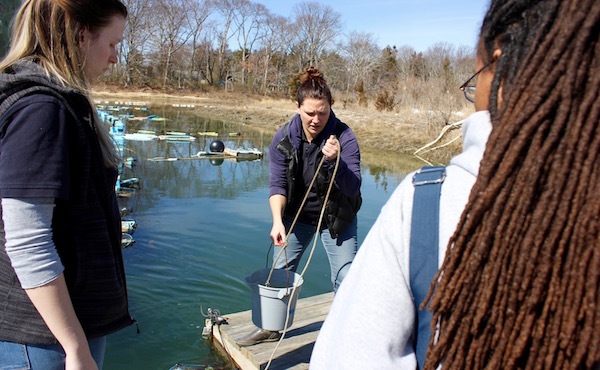 For now, said Ms. Jones, the volunteers’ focus will be on providing data on the water quality parameters in Cedar Beach Creek, where SCMELC has its Southold Program in Aquaculture Education (SPAT) volunteer oyster hatchery. Volunteers will test the water on five weekdays while the center is open. Ultimately, Ms. Jones said, the goal is to have volunteers sampling water throughout the estuary, in an attempt to gather a breadth of data not already being compiled by researchers. “We really don’t have information on what’s going on in other neighborhoods,” she said. For example, there are 12 water bodies within the Peconic Estuary system that are considered “impaired” water bodies, due largely to high bacteria levels or to harmful algae, which are fed by excess nitrogen in the water. Those water bodies include Hashamomuck Pond, Meetinghouse Creek, Reeves Bay, West Neck Bay, Accabonac Harbor, Dering Harbor, Sebonac Creek, Tanbark Creek and North Sea Harbor. Goose Creek, Richmond Creek, Town Creek and Jockey Creek in Southold Town are all also listed as impaired, though many in Southold believe this is due to inadequate testing due to staffing cuts at the state Department of Environmental Conservation. The CCE lab where Ms. Pfoertner works. While Southold’s Shellfish Advisory Committee has already trained people to collect water for tests, the DEC protocols for water samples make it very difficult for them to accept citizen science sampling. But PEP’s project has a different, more long-term aim, to be used in service to the program’s Comprehensive Conservation and Management Plan update, a three-year process which is getting underway this year. 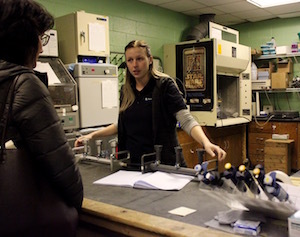 The Cornell Cooperative Extension lab at SCMELC, where Ms. Pfoertner works, has the capability to test the water samples gathered by the citizen scientists for bacterial contamination, and for DNA evaluation of that contamination, which can give researchers information about the animal (or human) that is the source of the bacteria. While the DNA testing is labor-intensive and expensive, the data it provides could prove very helpful as the Peconic Estuary Program outlines its goals for improving the health of different areas of the estuary through the CCMP. We’ll keep you updated on future citizen science training sessions! So You Want to Be a Shellfish Farmer?